Phil Collins’ third solo studio album was originally released on 18 February 1985. All the tracks were written by Phil, the lead vocalist and drummer for the rock band Genesis, except “Only You Know and I Know” (music by Daryl Stuermer who is also co-writter of “Doesn’t Anybody Stay Together Anymore” and “I Don’t Wanna Know”). The album produced four official singles including hit “One More Night”. 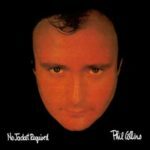 No Jacket required reached number 1 on the albums charts in the United States, U.K., Australia, Canada, New Zealand, Germany and many other European countries. You may also like: 80’s Best-selling albums in the U.K.